Entirely too many to post here, so just go to the gallery. Or go to Magpie’s gallery, which is much nicer. Or the team’s. The project this year was the entire roster, plus all three coaches, the team director, the general manager, the mascot, the logo, and the trophy we picked up in August. 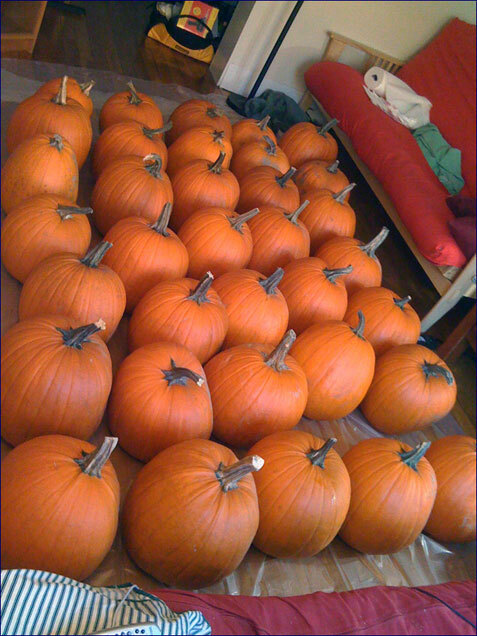 35 in total, mostly carved by me, some done by Magpie, with Julie and Magpie helping out on the scooping and cleaning, Julie on the pickup and delivery, and the three of us plus Mike on the actual setup at the stadium. This whole stunt was funded by the team itself, courtesy our pal Cathal in the front office. 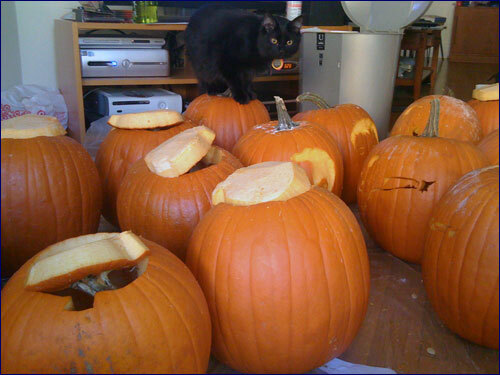 Too bad the game broke the streak of always winning when there’s pumpkins. This entry was posted in finished projects, goofy, I can't believe we pulled this off, melonhead, pumpkins, revs. Bookmark the permalink.